Normally, I am the first to jump on the "too many batman title" bandwagon, but I am going to make an exception for this little miniseries. The reasons why? It's a miniseries and Jim Lee, Brian Azzarello, and many other top-notch writers and artists are involved on the project. Coming in January BATMAN: EUROPA, a four-issue mini-series written to gritty perfection by FIRST WAVE’s Brian Azzarello and Matteo Casali with an all-star cast of artists, including Giuseppe Camuncoli (who is handling layouts for the entire series! ), Diego Latorre and Jock. With a first issue painted over Cammo’s layouts by none other than superstar artist and DC Comics Co-Publisher Jim Lee, who as you know, is no stranger to Batman. And if it involves Jim, you can guarantee it’s a major Batman tale. 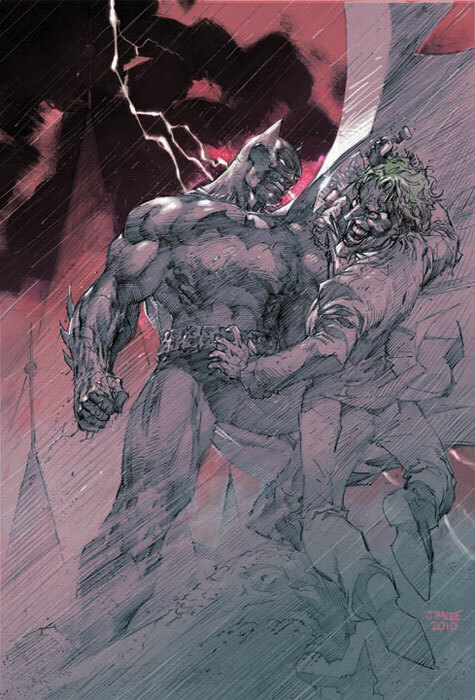 In the pages of BATMAN: EUROPA, the impossible has happened – the Batman is on the brink of defeat, at the hands of a virus with no cure. Surely there’s someone that can help him? Well, there is – the Joker. Who infected Batman with the virus? What does the Joker have to do to save him? And how can it all happen before the Dark Knight collapses? Together, the unlikely teammates and arch-foes travel through Europe cobbling together clues while the clock ticks down. Here is the first cover from the series, by Jim Lee, and it is beautiful. I cannot wait to read this tale.